Bernie Sanders does an hour in a Fox News town hall…. The media probably loved it…. Fox viewers probably do NOT vote in Democratic primaries…. 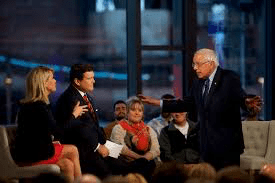 Some of the difficult questions asked by the hosts, Bret Baier and Martha MacCallum, were about Sanders’ “Medicare for All” plan….. The view from Fox News on the appearance…. Bernie Sanders took the stage at a fiery Fox News town hall in Bethlehem, Pennsylvania on Monday, and sparks flew almost immediately, as Sanders defiantly refused to explain why he would not voluntarily pay the massive new 52-percent “wealth tax” that he advocated imposing on the nation’s richest individuals. “We’ll get through this together,” Sanders said at one point, as tensions flared. Sanders later admitted outright that “you’re going to pay more in taxes” if he became president. Just minutes before the town hall began, Sanders released ten years of his tax returns, which he acknowledged showed that he had been “fortunate” even as he pushed for a more progressive tax system…. The Tax Day town hall took place as Sanders emerged as the fundraising front-runner among Democrats, and sought to further distinguish himself from a crowded field of liberal candidates who have largely embraced his progressive proposals, from a sweeping ‘Medicare for All’ overhaul to a higher minimum wage and free public college education. “I think Trump is a dangerous president, but if all we do is focus on him, we lose,” Sanders said at the town hall. Some estimates put the total costs for the plan over 10 years at more than $32 trillion, and say it would necessitate historic tax hikes…..
Did you read the part about even though the sundown was a Fox News one? The room was packed with Sanders supporters?.….